There is some difference between Brother SE400 and PE500 in basic functioning. 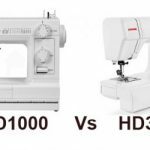 So the choice depends on the price and whether you already own a sewing machine or not. Brother SE400 and PE500 are two popular beginners embroidery machines. Even though prices differ from time to time, there used to be a significant price difference between these two models with PE500 being the least expensive model. The comparison becomes valid only if there is a huge price difference between the two (Ideally in the range of $50 – $100), otherwise SE400 steals the deal. Now let us have a closer look at both models, so that you can make a choice. When you look at both machines from a distance, you get a feeling that both are identical. But only a closer look reveals the differences. First of all, we will be taking about the areas where these two machines differ. We will have a look at all other features later on. Basic Functioning : 9 out of 10 times, this is where the decision is made. PE500 is an embroidery only machine, whereas SE400 is a sewing & embroidery combo machine. SE400 has all the features of PE500 plus the capability of regular sewing. So SE400 would be a good choice for those who don’t own a regular sewing machine, as they can do sewing and embroidery all in one machine. 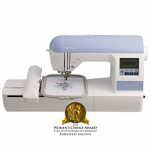 Built-in Stitches : SE400 comes with 67 sewing stitches (including 10 one-step buttonholes), 70 embroidery designs, 120 frame pattern combinations and 5 embroidery lettering fonts. PE500 comes with 70 embroidery designs, 120 frame pattern combinations and 5 embroidery lettering fonts. The only thing missing is the sewing stitches. Embroidery Features : Absolutely no difference here. Both machines come with a maximum embroidery area of 4″x4″. The embroidery speeds are also the same, at 400 stitches/min. There are layout function and pattern rotating on both machines. Computer connectivity on both machines lets you download unlimited number of designs from iBroidery.com and other websites. So the room for creativity is virtually limitless. Actually I was looking to provide a table for side by side comparison, but since the embroidery features of both machines are identical, I decided against it. I hope you understand. You really can’t see a difference here, as the parts and motor used are almost identical. 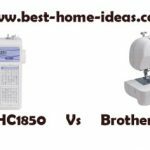 Both are excellent machines for embroidery. In fact, these two have the best customer feedback for beginners embroidery machines. 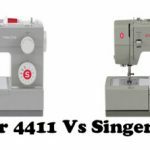 You can say that SE400 is slightly better for beginners as you don’t need to switch machines for embroidery and sewing tasks. The sewing features of SE400 needs special mention here as this is what makes the ultimate difference. PE500 is an embroidery only machine and SE400 is a sewing & embroidery combo machine, that says all. 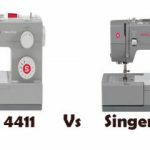 If you take the sewing features of SE400 alone, you will see that it packs all the features that you normally get on a Brother sewing machine that costs between $150 – $180. The remaining amount is what you pay for embroidery features. To make things easier for you, below are my recommendations. Go with PE500 if it is at least $75 cheaper than SE400 and you have a regular sewing machine at home (which has all the sewing features of SE400). Go for SE400, if the above two conditions are not met. My personal recommendation will always be Brother SE400. SE400 is the upgraded version of PE500. It also features in our list of ‘Machines You Can Buy With Your Eyes Shut’. It is that good a machine.